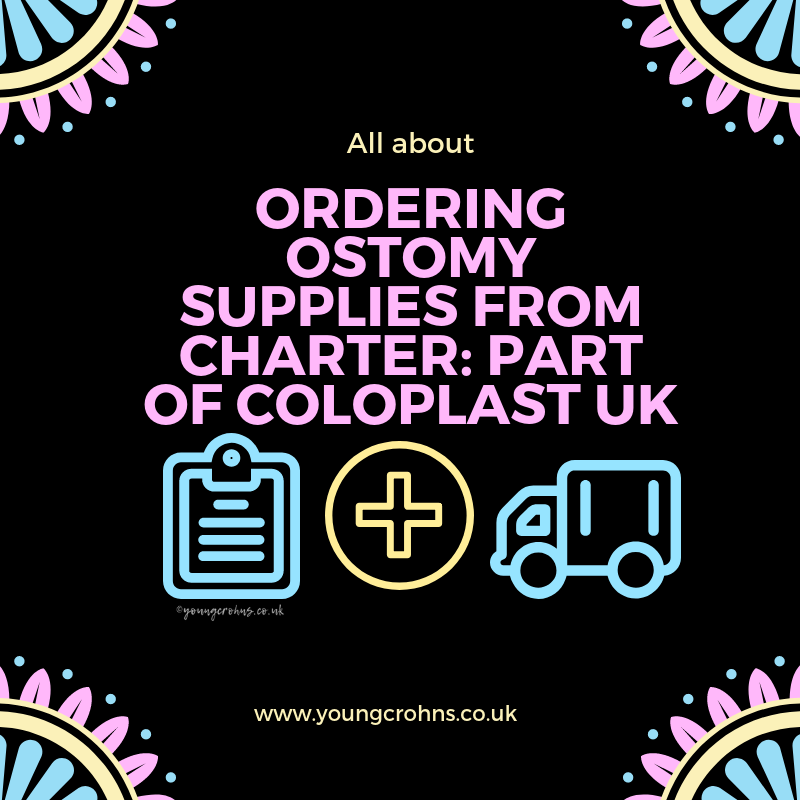 Almost all new ostomates from the hospital would recommend Charter for their level of professionalism, knowledge and friendly advisers. Once you place an order (whether via the phone or website), the order is placed onto the system. I place my orders online via their web portal. After my first prescription was submitted back in September, my usual items come up as “favourites” and I can reorder these straight away. Lately, I’ve needed extra products or I’ve begun a new routine of changing my bag – ie when I had a peristomal rash or changed brand of protective ring – so I go through and manually search for this item – either by brand and item or the item code; usually on the actual item. 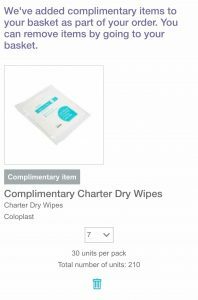 With every order of a prescription item, they add complimentary items – dry wipes, disposable bags and wet wipes. I usually order additional dry wipes because my ileostomy output is always more liquid. With orders of ostomy bags, they ask if you’d like them cut or left as they are. As my stoma has been changing size, I’ve always cut my bags myself; this ensures a good fit every time. 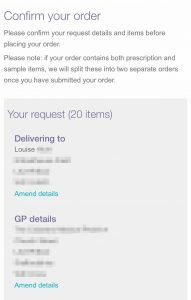 Once I’ve gone through finding my items and ordering the correct amount, I then confirm my GP surgery – making sure the telephone and fax numbers are correct! 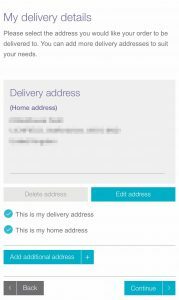 – then my delivery address. I then get a receipt on the webpage as well as an email. I can place my order online 24/7. Obviously, this means it gets processed when the office next opens. 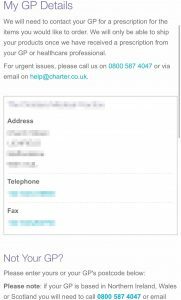 Provided that there are no anomalies, tthe order is then accepted by Charter and Charter then requests the prescription from your GP on your behalf. I then get a text message saying my order has been placed and it is then sent to my GP. I can now track the progress of this online, but it usually takes a couple days to come back to Charter; the longest I’ve waited in a week. 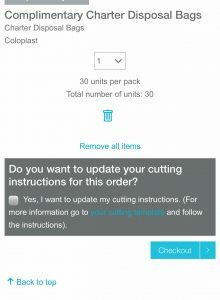 I always adhere to Charter’s guideline of a two week turn around, so I order when my supplies are getting low but not empty – I use ostobuddy app for iPhone to keep track of my ostomy items – with enough to get me through two weeks plus a couple of emergency bag changes, because you never know! If the GP is set up for Electronic Prescription Services, this is all done electronically, otherwise it will be faxed or posted. The GP has to sign off all the items before they can be despatched due to new legislation (it used to be that orders could just be sent out and the prescription could be obtained afterwards, so orders used to be sent out very quickly in the past, but new legislation dictates that the prescription must be received before any items are sent out, and so Charter always recommends that you order with a window of two-week’s worth of supplies in case the GP takes a while to sign off the prescription). 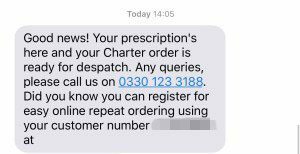 Anything that I order for the first time needs authorising by the GP who does the prescriptions at our practice. 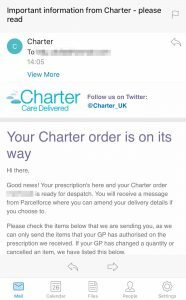 I’ve now got the point where my prescription contains just one new item so I just have to wait for this to be approved, it then doesn’t take too long for Charter to get it back. 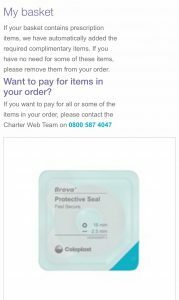 Once the prescription has been received by Charter, the order is sent to the warehouse where they can then pick and pack the items. 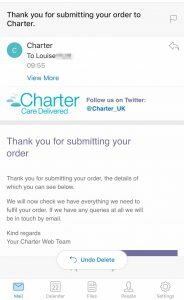 I receive a text to say that my order has been received back at the Charter offices and it is now going to the warehouse to be compiled and packed. They then say when it is ready to be dispatched – for me it’s always been the same day but if stocks are low or its a busy period, such as Christmas, this can be abit longer – and the delivery company will take over communications from here. If there are ostomy pouches that need cutting in the cutting room, a template for each customer is stored on the system and is programmed into the cutting machines. If the hole is irregular (ie. not round) then it is cut by hand. Delivery is usually 24-48 hours after receiving the prescription from the GP. 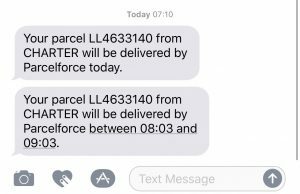 The parcels are sent via Parcelforce and, if you have order notifications activated, then you will receive updates about your order. 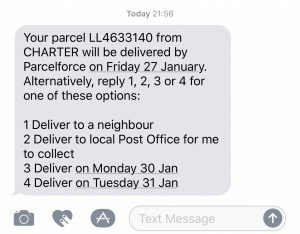 I have a message from Parcelforce saying my order is going to be delivered on ‘X’ day – usually the next working day – and I can reply if I would like it be delivered on an alternative date, left with a neighbour or to the local post office. You have to sign for your items, so I always make sure I have it for a date when I am definitely going to be home. I usually try and order with the knowledge that I will probably be home at least one day the next week. On the day of delivery, I get a text to say it’ll be delivered then a second one to notify me of the time window. The process for me has been really good. 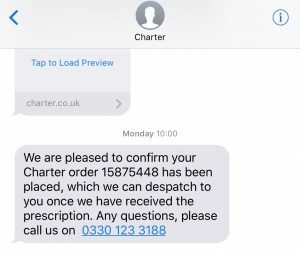 I’ve only had to talk directly to Charter a few times; mostly over Christmas when I wasn’t sure if my order had been placed and it was a couple days before Christmas…! They are helpful, professional and easy to talk to. I would highly recommend them if you like to use online services. Being kept in the loop at every stage is excellent too; takes away a lot of stress and anxiety of having to ring up and possibly chase. A very prompt and efficient service! Disclaimer: Occasionally, I am asked to visit companies, review products and services. I am compensated for my time, which helps pay for the running of this site. I work with companies who I believe have IBD and ostomy patients best interests at heart. In light of this, all views and experiences shared on this blog are mine and of my own honest opinion, and do not reflect the official position of any company I review for or visit.